Randall Thompson, composer of "Alleluia"
WRTI's Kile Smith looks at the 75th anniversary of the Randall Thompson Alleluia. Over five days he took the word Alleluia and turned it on its head. From Randall Thompson, the composer who was then the Director of the Curtis Institute of Music, conductor Serge Koussevitzky requested a loud and festive choral fanfare. It was to open the Berkshire Music Center at Tanglewood. But this was July 1940, and Thompson couldn’t do festive, not then. Evil was spreading in Europe in a world war America was debating whether to join; France had fallen the month before. So what did Thompson compose? Thompson calls this a sad piece, this six-minute slow and insistent layered intoning of “Alleluia,” ending in “Amen.” It’s about the last thing you’d think of composing for an alleluia or for a fanfare. But Alleluia by Randall Thompson is one of the most beloved choral works of all time. Randall Thompson's Alleluia, performed by Voices of Ascension, Dennis Keene, conductor, is featured on CD 2 in the WRTI 60th Anniversary Classical 3-CD set. 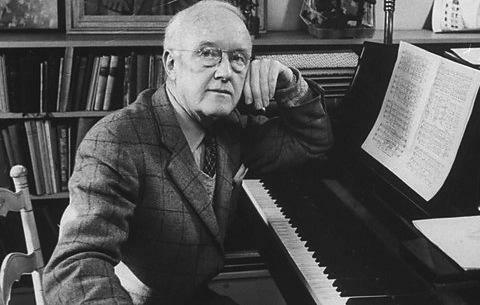 From Randall Thompson, then Director of the Curtis Institute of Music, Serge Koussevitzky wanted a choral fanfare, loud and festive, for the opening of the Berkshire Music Center at Tanglewood. But Thompson couldn’t do festive, not in July 1940. Evil was spreading in Europe, and France had fallen the month before. Over five days Thompson took the word “Alleluia”—literally, “Praise the Lord”—and turned it on its head, just as (he said later) it is in the Book of Job: “The Lord gave and the Lord has taken away. Blessed be the name of the Lord.” Thompson calls this a sad piece, this slow and insistent six-minute layered intoning of “Alleluia,” ending in “Amen.” It’s an atypical fanfare, but the Thompson Alleluia is one of the most beloved choral works of all time. Check out all of the 60th anniversary Classical CD highlights here! Contribute today at the $160 level and we'll thank you with our limited-edition WRTI 60th Anniversary CDs. Choose either our Classical (3 CDs) or Jazz (2 CDs) sets with notes from your favorite hosts. Pledge Here, and Thanks!